You may have noticed that after all these years, Eustace Tilley never got contacts, or even ditched the monocle for a full set of frames. And forget about laser eye surgery. Like their mascot, the New Yorker isn’t one for technology. Their Web site looks like it was designed in 1999, and only a few of their articles are online. Their “Web only” features, like Daniel Raeburn’s account of the successful birth of his daughter after a devastating stillborn birth, are boring. Occasionally, the magazine does look at this crazy thing called the Internet. But the intelligence and wit that I usually enjoy in New Yorker articles were absent in recent pieces on the Facebook and College Humor. 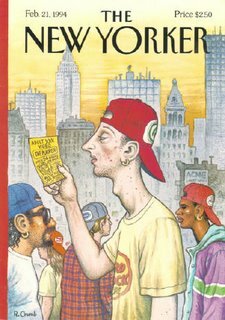 The problem is that the New Yorker isn’t a news magazine. It’s a literary magazine that occasionally reports news. Aside from Seymour Hersh, the New Yorker doesn’t break news, it writes up old news with style. When John Cassidy decided to report on something as over-reported as the Facebook, he needed to go beyond the privacy issues and explore the way people deal with this new medium of self-representation and voyeurism. Instead, he just made the founder of Facebook seem like a prick. Undeterred by the critics at Raronauer’ed, this week Stacy Schiff spends a few thousands words on the Internet sensation Wikipedia. Fortunately, the piece was better than Rebecca Mead’s College Humor disaster. The most interesting parts were about the community of Wikipedia writers and editors, but if you’ve read one Week In Review article about the free encyclopedia that anyone can edit, you can skip the New Yorker’s version. Stace spends most of her word allotment on the accuracy problems that plague Wikipedia. But she never interviews the typical Wikipedia user: The office rat. And since she never talks to us, she never mentions that that most Wikipedia users think of the site as a fun diversion, not a serious source of information. She doesn’t examine how people use the site, which in my case involves the reading plot summaries of books I’m in the middle of to spoil it for myself. For me, Wikipedia is an entertaining way to see how a semi-trusted source would describe This American Life or Dr. Brown’s soda. Where once encyclopedia reading was laborious, Wikipedia has made it a good distraction at work. For many, the convenience is worth the inaccuracy. Part of the problem is that New Yorker staff writers don’t use the Internet the way as people from my generation do. John Cassidy could never understand the pleasure of looking at pictures of the girlfriend of that guy from your American Lit class. Unfortunately, the people who do probably can’t write very convincingly about it.